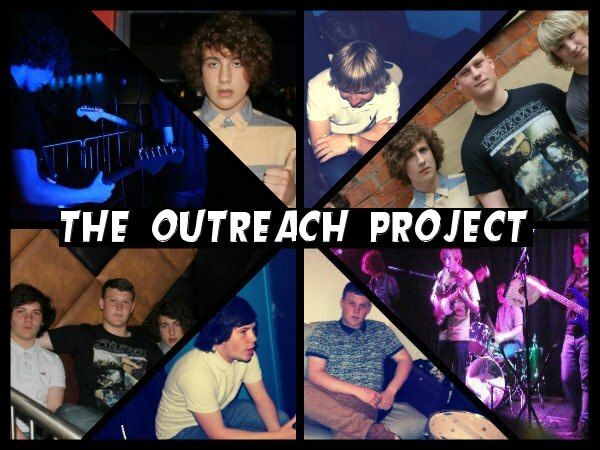 The Outreach Project are an Indie -rock- band, whose lively vocal performances and spectrum of guitar riffs makes them a sprightly and multi-genre band . With James Ward-Mallinson on vocals/rhythm guitar, Kieran Abbey on lead guitar, Louie Donnelly on bass guitar/backing vocals and Jack Scraggs on drums & backing vocals, The Outreach Project formed in December 2011 as a charity band, raising money for children in Ethiopia, Africa and playing charity gigs across Manchester, Liverpool and London. With such a refreshing and humane approach to music, it’s also great to be able to report that The Outreach Project are a brilliant new band. It’s hard to believe that they haven’t really been playing so long, yet have mastered their style and emit a fluidity which hasn’t set them in stone. As a frontman Mallinson is a crossbreed of Jack White and Alex Turner, conveying a sort of bohemian Street-poet, whose raw, idiosyncratic tones makes him an individualistic and interesting frontman. Having recently completed their EP ‘On The Moors’ due to be released on 15th February 2013, The Outreach are set to make waves across Manchester with their infectious, spirited and guitar entrenched songs. As a guitar band, The Outreach Project really go for the jugular, which is showcased in the self-titled song “Intro”. It’s here that the vocally–free song illustrates its fluidity, switching with ease from early Manic Street Preachers to more heavy-duty Led- Zeppelin riffs. As a debut song on the EP, you quickly hear their skill at playing those guitars and their dexterity of alternating sub-genres. With “Conscience”, you hear how the initial reverberating riffs morph into more choppy riffs that synchronise with the pogo beats creating an upbeat frenzy of sounds. Along with Mallinson’s animated, restless vocals “Conscience” evokes a free-spirited, gregarious feel that resonates against the backdrop of wayward riffs. It’s an eclectic number, whose loaded lyrics, effortlessly roll off the tongue, producing gems such as “Steamy Windows, and torn off clothes, messed up hair and broken stilettos “. It’s also a song which builds to a crescendo through its zig-zag and looping riffs that tilt towards Zeppelin territory. Again with “Monte Carlo”, you see how Mallinson’s versatile vocals capture the mood and sentiments of the song. Ingeniously “Monte Carlo” emits a kitchen-sink realism that is filtered through the repetitive narratives and wry lyrics. Lyrics such a “Fly me off to Monte Carlo, where the sky is blue and the women are shallow…”, highlights the band’s skill at loaded song-writing which in this case contrasts with the sunny soundscape. With its jangly, looping Spanish guitar riffs and aloof floating flute, “Monte Carlo” conjures up the romantic setting of a distant place to escape too. “Twisted Persona” is one of The Outreach Project’s stripped down songs, whose fast-moving acoustic riffs, slam, slant and curl around Mallison’s raw vocals. Notably Mallison’s vocals are more laid-back, accentuating his Celtic tones, which help create a more authentic folk sound. Along with the dual backing vocals, it’s also the fleeting wave of droning rifts that creates a quirky insert, encapsulating the shadows of the song. Lyrically more introspective, “Twisted Persona”s sentiment is captured with the lyrics “Never mind my twisted persona, I’ll keep walking it over, I’ll keep walking it over to you…” , whilst remaining an accessible folk-rock song. What starts of melancholic and slightly mournful soon morphs into a psychedelic-infused post punk song. From it’s initial tinkering riffs, “Brien” unleashes an impressive range of scrapey and jangly riffs that jitter and soar around Mallinson’s vocals. It’s an upbeat song, which sees Mallinson’s vocals become eclipsed by the wave of Wah garage riffs likened to The Black Keys that whirl and drone in a psychedelic fuzz. Without the folk harmonising or chanting, “Brien” builds to an excitable crescendo likened to Of Monsters of Men and Arcade Fire, proving that they are very much the eclectic and spontaneous band. “She’s In Control” once again illustrates The Outreach Project’s skill at producing a polemic and mutating range of riffs. What starts out as screechy riffs likened to The Cocteau Twins then morphs into more telescopic riffs that shimmer, rotate and loop around the restless acoustic riffs. It’s also a song whose aloof drums are reminiscent of Joy Division which tilts “She’s In Control” back to its post-punk roots. What’s great about “She’s In Control” is it conjures up the spirit of The Outreach Project, a sort of liberal folk-rock band which isn’t afraid to experiment and whose gritty lyrics are loosened by Mallinson’s lively vocals. In particular with lyrics such as “Used and abused everytime you are blinking, you’re just a fool, what have you been drinking.” ,you hear Mallison likeness to Alex Turner, not just in his delivery but in his ability to pen those kitchen-sink observations, with clarity and wit.